Colour Sound Experiment (CSE) has made a substantial new investment in LED screen with the purchase of 100 square metres of BT6 6mm pitch high resolution surface. The product has been manufactured specially for CSE to their specifications and will join the company’s existing stock of BT12 and BT37 screens, all from the same factory, designed and built to the same exacting quality standards. CSE’s choice of manufacturer was made after extensive research and careful consideration. The relationship has been developed over the last four years buoyed by the experiences in particular of the last batch of BT12, purchased in 2011. The BT6 features black-faced LEDs which offer a higher contract ration – in this case of 4000:1 – plus a much neater appearance. It also has a high refresh rate of 4800Hz which eliminates moiring and flicker, making it very camera friendly, an essential requirement with so many shows also involving IMAG/camera relay in some capacity. As well as these advantages, it is very lightweight – at 24kg per square metre (a characteristic of the other BT versions too) – and quick and easy to rig. The bespoke rigging system is TUV certified, meets all the standard H&S requirements and works via a proven quick-lock fixing system for rapid deployment. The first job for all 100 square metres of CSE’s BT6 is for Vodafone. Having large quantities of different pitch LED screen enables Colour Sound to offer its clients the most flexible, versatile and cost-effective ‘visuals’ solutions – suitable for the sector and the specific designed environment. Right from the start, the company has been a driver in the move towards ‘convergence’ a concept foreseen and talked about for some time, that is now becoming a practical reality – on both creative and commercial fronts – as sourcing lighting and visuals from one company becomes more viable. The LED screens are also a perfect complement to CSE’s stock of Green Hippo, Catalyst and ArKaos media servers. When the new delivery of BT20 arrives in CSE’s west London warehouse in May, their total stock of LED screen will be in excess of 500 square metres. All of this is already booked out through the summer, when CSE is mega-busy supplying festivals, dance and live music events with lighting, LED screens and crews – at least 50 festivals are already confirmed. 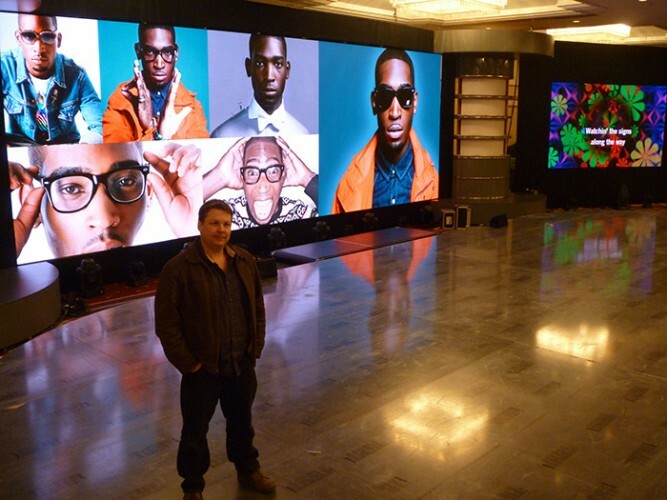 In picture: Colour Sound’s Haydn Cruickshank with some of the new BT6 LED screen.